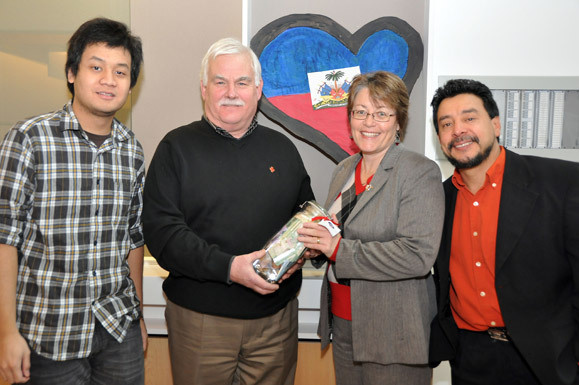 From left, UBC Okanagan student Adi Prabowo, who helped organize last Sunday's Haiti benefit concert at UBC Okanagan, John Richey, regional manager of the Southern Interior Canadian Red Cross, Teresa Flanagan, international student advisor, and Professor Hugo De Burgos, one of the musicians who performed at the event. A special concert, silent auction and bake sale at UBC Okanagan last Sunday raised $3,117 for the Haiti earthquake relief effort. Federal government dollar-matching means the fund-raiser represents more than $6,200 for the Canadian Red Cross, says Teresa Flanagan, International Student Advisor and one of the event organizers. The concert included performances by a variety of groups including Hugo De Burgos and Friends, the Latin Dance Club, recording artist Chris Thompson, setar musician and singer Mahdi Modirzadeh, poet Heidi Garnett, and many more students who shared their talents and time.